In order to avoid taking offence, give others the benefit of a doubt. Choose to trust their hearts. Choose to believe that their intentions were true, even when what they did or said hurt. This last week I sat down with a friend and as we chatted, I was reminded how easily we take things the wrong way. And then we walk away offended. And taking offence is never a healthy thing for relationships. What can we do, to minimize the offences we take on? Give them the benefit of a doubt. Sometimes our friends and colleagues mess up and they do things that hurt. Our natural tendency is to make their slights things of the heart. We file those slights as if they were intentional without thinking twice about it. Choose to see every action or word that stings as unintentional. 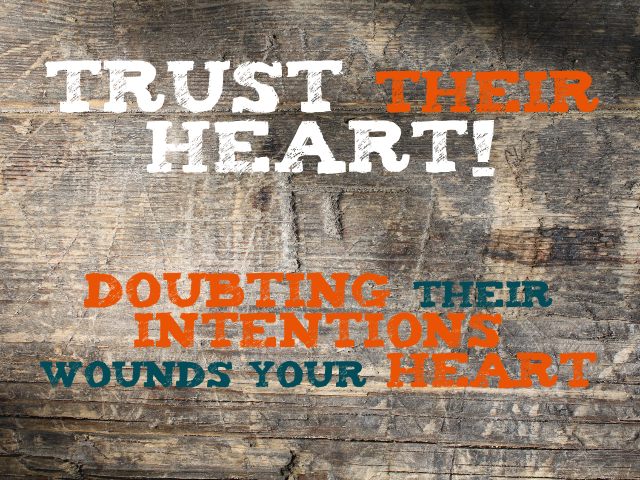 Choose to trust their heart and believe that they did not intend to hurt you. That it was an oversight on their part. If you choose to believe they were intentionally hurting you with their words and actions, you will get offended easily. Everybody has character flaws that have the ability to hurt others, and at times they make it seem as if we don’t care or we do these things on purpose. But the truth is, most of these instances are the result of our own personal character blind spots. Recognize that you have those blind spots too, and treat theirs with the grace that you wish them to treat yours with. Excuse them, or remind them with the love that says: “I love you enough to want to help you become better. Can you do the same for me?” If you just want them to become perfect without being challenged to grow yourself, don’t remind them of their blind spots. Repeatedly? Yes! How often? Seventy times seven! That is what Jesus told Peter when he asked Him how often he needed to forgive others. And I don’t think Jesus intended for us to pull out a clipboard and start to count the times we forgive that person for the same thing. Remember, how do you want to be treated? Golden Rule anyone? “Do unto others as you would have them do unto you.” And to forgive means you no longer hold it against them. It’s history! The loss has been written off. Noting how often you have had to forgive is withholding full forgiveness. The more intentional you get at piling slights and offences onto the “They didn’t mean it” pile, the better your grace towards others will grow. And the more gracious you will be with their character flaws, the easier you will find it to forgive. And the easier you forgive, the greater of a friend you’ll be to them. And the greater of a friend you are to them, the more they will work to stay in your graces. Is there somebody whose offences you need to move from the “they intended to hurt me” to the “they didn’t mean it” pile?